These are making a great splash of colour around the country side now. We have a couple and when the seed pods set and seed is ripening, the galahs have a great feed from them. Unfortunately it does not deter them from the almond trees. One day I would like to have just one feed from the tree, instead of these freeloaders getting the lot. 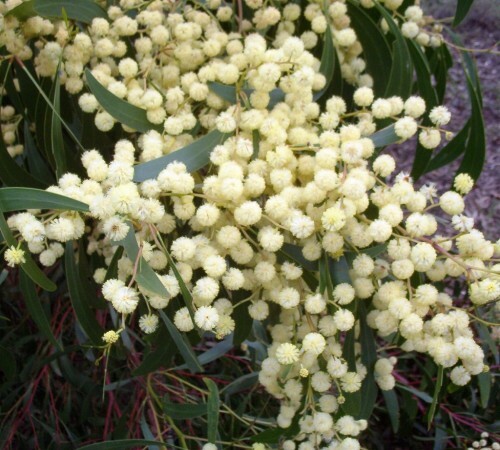 However I have found a few trees that have cream flowers rather than the golden yellow balls. The trees still seem to have the same form, although here they don’t grow as tall as they might in a higher rainfall area. In a good season we do get seed germinating near the parent tree. This winter has been so dry that it won’t happen this year. In general Acacias make great plants for windbreaks. Those trees that get artificail watering from, say, a sprinkler on a lawn, don’t seem to live as long as those in the bush.